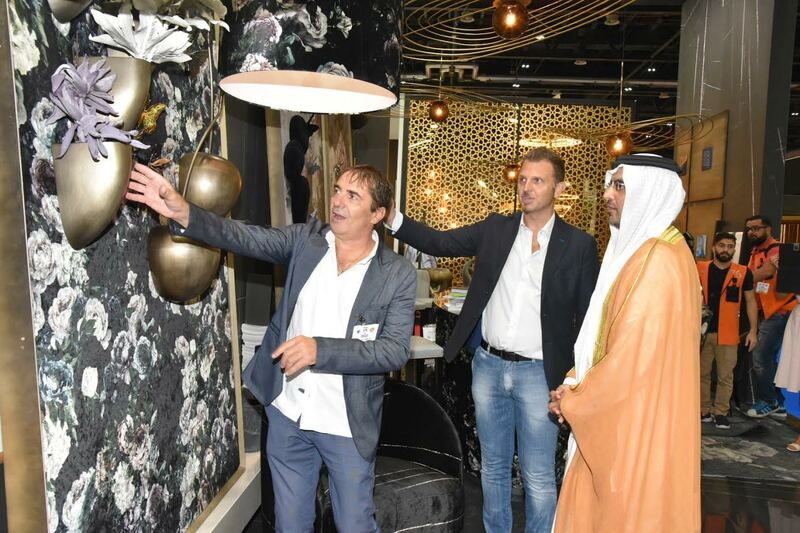 Dubai, UAE: Exhibitors and visitors alike spoke of excitement heading into day two of the 2016 Hotel and Leisure Shows after a busy opening day flush with international dignitaries and leading hospitality industry experts and professionals. His Excellency Majid Saif Al Ghurair, Chairman of the Dubai Chamber of Commerce and Industry, officially opened the 2016 editions. Local and international dignitaries from as far as Germany and the Philippines also explored the 600 exhibitor stands on display from more than 50 countries. Her Excellency Sheikha Dr Hind bint Abdulaziz Al Qassimi opened the DA International Interior Design LLC stand in support of the arts and interiors company, as well as its local and international artists on display. The key industry events – also co-located with Piscine Middle East for the first time this year – are set to run until 19th September 2016 at the Dubai World Trade Centre. Today the shows welcomed both Ambassador of Ireland, Patrick Hennessy, and His Excellency Christian Watts, Consul General of Switzerland. As well as hundreds of stands, the shows incorporate a busy schedule of expert led discussions and hands-on workshops. On the 2nd day of the Vision Conference, experts from Deloitte, TOPHOTELPROJECTS and TNS took to the stage, alongside hoteliers from the brand new W Dubai – Al Habtoor City and Nikki Beach Resort & Spa Dubai. For the first time this year, The Hotel Show also plays host to a number of fascinating interactive features, including the live painting of two incredible art installations – a collaboration between 17A Art Consultants and BAGNODESIGN, focused on the future of hospitality and bathroom design – and the on-site manufacturing of hospitality uniforms by industry-leading A. Ronai. Two huge food trucks also help visitors discover and explore the current influence of street art and culture on hotel and restaurant design. The Hotel Show Dubai is organised by dmg events Middle East, Asia & Africa and belongs to the dmg hospitality portfolio comprising of The Hotel Show Dubai, The Hotel Show Saudi Arabia, The Leisure Show Dubai, Piscine Middle East, Middle East Hotel Awards, Saudi Arabia Hospitality Awards, Middle East Pool & Spa Awards, Vision Conference and TecSec Summit. The Hotel Show Dubai (17-19th September 2016, Dubai World Trade Centre), part of the dmg events hospitality portfolio, is a pivotal business forum for the hospitality industry in the Middle East and Africa. Working with the Department of Tourism and Commerce Marketing, industry associations, and partners, the 2016 event includes visionary features, extensive educational content (through its Vision Conference and TecSec Summit) and other knowledge sharing platforms together with senior level networking; co-located with The Leisure Show – the region’s only event dedicated to its growing leisure industry. Piscine Middle East is a growing event in UAE that draws pool and spa professionals of all types, giving them a unique opportunity to meet and exchange ideas: visitors, exhibitors, journalists, federations, etc. In 2014, Piscine Middle-East welcomed 2,800 visitors and hosted more than 100 different brands. Building on its success, Piscine Global, the world leading pool and spa show (600 exhibitors and 18,000 visitors) has developed Piscine OPEN (Piscine Overseas Pool export Network), which today comprises 3 international pool and spa exhibitions, to support manufacturers and suppliers as they develop their international business. Headquartered in Dubai, UAE and with satellite offices in India, South Africa and the UK, dmg events Middle East, Asia & Africa organises over 45 events across the Middle East, Africa, Asia, North America and Europe. The company employs more than 10,000 people and is listed on the London Stock Exchange.